Tanzania offers incredible diversity and in some ways the 'exclusivity' of Botswana or some South African camps, but far less expensively. 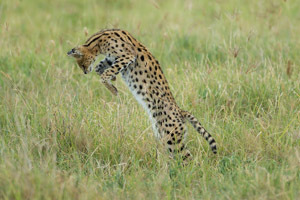 Truly, Tanzania offers the best and the classic safari experience. Check out our trip reports for more information, too! 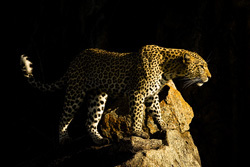 Each trip report provides a day-by-day journal account of what we saw and photographed, and will provide you with an honest assessment of our safaris. 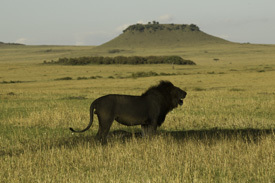 The sense of wilderness one feels in the Serengeti is without parallel in Africa. 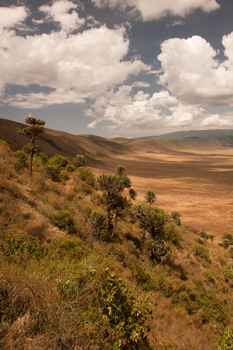 The name, Serengeti, is derived from a Maasia word for endless space, and you feel as if you can see forever - some of the vistas just sweep on to the horizon. 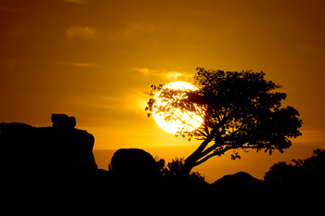 I've been to most of the great African destinations - Uganda, Kenya, Namibia, Botswana, and my 'take' on Tanzania is this: The Serengeti offers the sense of exclusiveness and luxury that Botswana is known for, but without the high tariff and air/luggage limitations that that country imposes. 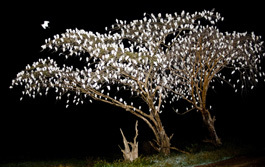 Further, I thought I had 'seen' the Migration in Kenya, but truly nothing prepared us for the numbers we see in Tanzania, it is unforgettable. Each trip is different and offers its own incredible highlights. 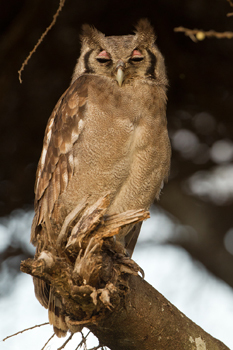 We've had incredibly tame bat-eared fox at their den with young, rare Aardwolfs denning, and Fischer's lovebirds at their roosting holes. 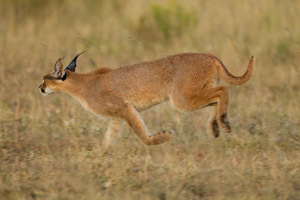 We've had Servals close enough for full-frame images, and on most of our trips we've seen and photographed one of the true trophy cats, the Caracal. 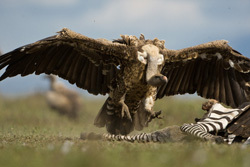 We've had tree-climbing Lions and herds of Elephants against a dark, stormy sky, and eyeball shots of Hippos, or incredible action shots of Zebras running through the water and fighting. There are so many highlights that the best way for me to convey the sense of quality photography and the wonderful experiences is to look at our various trip reports made over the years, or our most recent report for February of 2016. 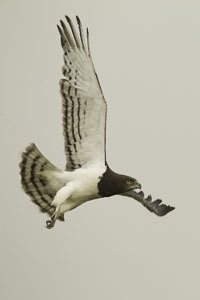 There is spectacular bird life, incredible landscapes and the migration itself. Imagine a wide-angle shot with kopjes in the foreground, surrounded by hundreds of animals, and a cloudscape of white, puffy clouds. Besides the nearly 2 million Wildebeest, there are almost 500,000 Zebras and countless Topi and Thompson's Gazelles mixed in with the herds. The numbers are staggering. This movement of so many animals at one time is truly one of the natural wonders of the world. And you will be there in the middle of it to experience it! Despite the fact that we are there in PEAK SEASON there will be times when our vehicles are the only ones in sight. Hours have gone by in the past when we saw only one or two other vehicles. You get the sense that this trip, this experience, is for your eyes only. You will love the exclusivity. 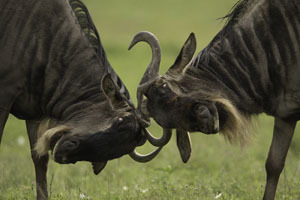 The Mammals: Our primary objective, indeed, the reason most people travel to the Serengeti from January to March, is to see the wildebeest migration. 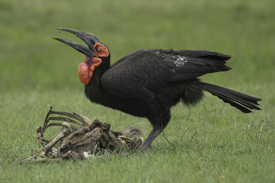 Our itinerary is timed to MAXIMIZE the chances of our hitting the gnu birthing cycle at its peak. 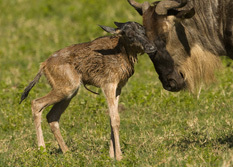 Gnus are eruptive breeders, with 90% of the entire population giving birth within a month or six-week span. With 500,000 or so females, that's a potential of at least 250,000 calves, if not 500,000, during this time. 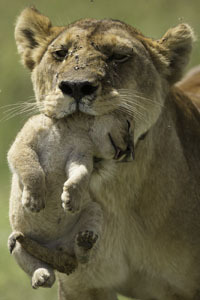 Calves and afterbirths are the cheap fast food of the grasslands, and predators reap a bounty during this time. But they can only eat so much. Please remember, gnus don't read brochures. 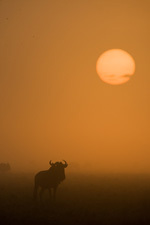 One year, I'm told, the gnus never left Kenya and the northern section of the Serengeti, and did their birthing there. The peak birthing period could be earlier, or later, but historically, it is usually at the time we're scheduled to go. We'll be spending approximately seven days in the areas where we can expect gnus, so we're stacking the deck in our favor. 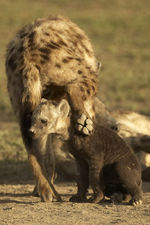 Additionally, of course, we'll be seeing and photographing everything the Serengeti has to offer. 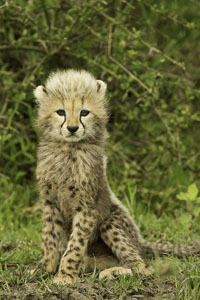 On a typical safari we photograph incredible Lions, Cheetahs, Leopards, Spotted Hyenas, and various Jackals. We've also done quite well with the elusive Caracal, Serval, and Aardwolf. 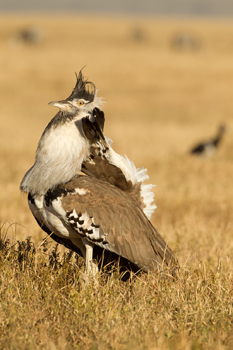 You can expect to photograph all the plains animals, like Zebras, Thompson and Grant's Gazelles, Topis, Hartebeest, and Giraffes. 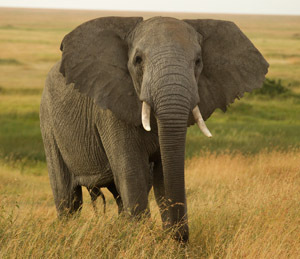 In the Ngorongoro Crater there are great bull Elephants, Black Rhino, Lions and Hyenas, Servals and all the grazing animals. 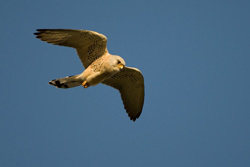 The Birds: We always have spectacular luck with birds. 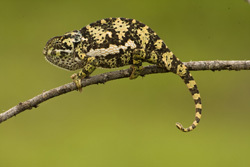 On a typical safari you can expect to photograph at least forty species without even trying, and seeing, or photographing over 100 species if you make any type of effort. 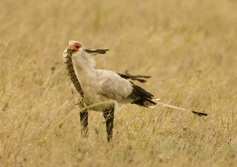 Bird shooting is great, both in the Serengeti and also in Ngorongoro. The Landscapes: They are incredible. 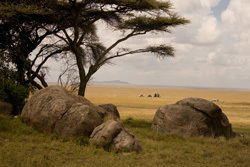 The Serengeti is known for two things - the vast grasslands, and the granite rocky outcroppings, called kopjes. 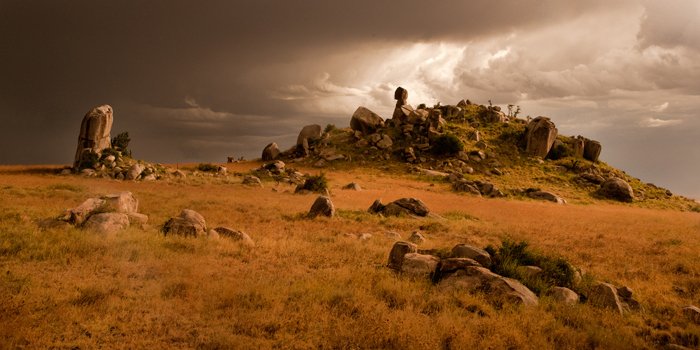 The kopjes are intoxicating; each is different, and each kopje is actually an island in a sea of grass. We'll be visiting several, including the most beautiful and extensive Gol kopjes. 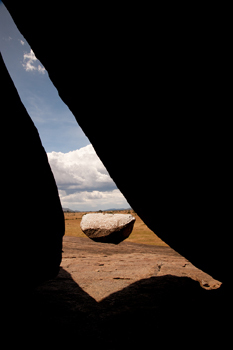 Kopjes are great from any angle - telephoto distant shots, wide-angle skyscapes, and vignettes. My favorite compositions included foreground kopje rocks or ledges that framed or led the eye towards another set of kopjes in the distance. 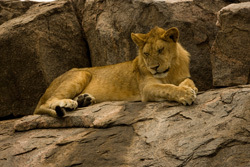 We usually have Cheetahs at several kopjes, and Lions are usually present at every one we visit, so wildlife opportunities certainly combine with the scenic potential here. 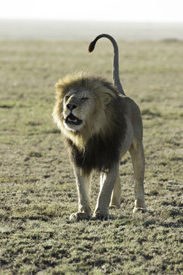 Our Locations: We'll be staying at four locations, three in the Serengeti and one in Ngorongoro. In the Serengeti, we'll be visiting several widely diverse locations. 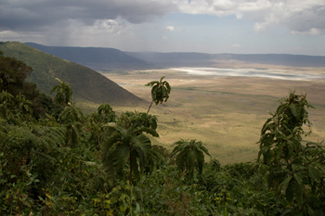 One, at the Ndutu Forest, is a part of the Ngorongoro Conservation Area. 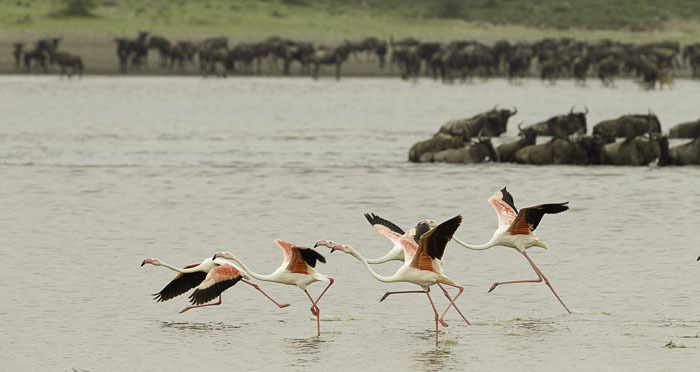 The Ndutu area is wooded, with an alkaline lake nearby that hosts, in winter, the largest concentration of European storks we've ever seen. 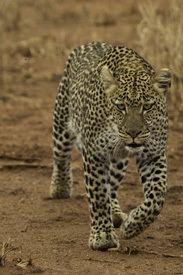 Leopards are common here. From this base, we will HAVE THE PERMITS to allow us to travel into either the Serengeti or the Ngorongoro Conservation Area to go to where the gnus are. This gives us the freedom and the opportunity to go to where the action is, and to not be limited or have to make excuses as to why we're not seeing game. 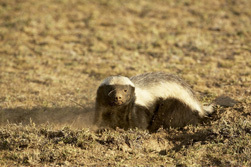 Iconic locations, like Matiti and the Kasini Plains, will be visited, provided the gnu herds are there. 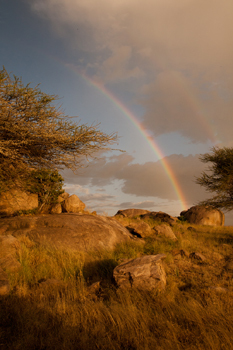 From our base at Naabi Hill we'll have the entire lower Serengeti, including the Gol Kopjes, Simba Kopjes, and Moru Kopjes. 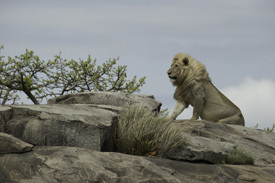 From this base we'll have a diversity of Serengeti landscapes and wildlife, including the classic, iconic images of lions on kopjes or cheetahs hunting through the grasslands. One of our favorate locations is the Gol Kopjes. Kopjes are unique granite extrusions that produce their own micro habitat of vegetation, and these scenic rocky islands are always visually appealing. 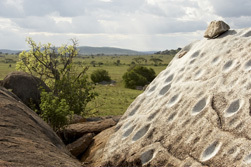 Kopjes are also the resting areas and hunting lookouts for predators, especially Lions and Cheetahs, and images of the great cats on these weathered rock faces are true iconic images of the Serengeti. At a spectacular camp called Sametu, we'll be in prime game country and a convenient commute to the Seronera area in the central sector of the Serengeti. 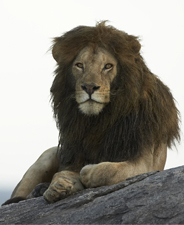 This is the area where we can find the famous tree-climbing lions and which has the highest density of leopards. We will drive along the Seronera River looking for the big cats and from our camp we will visit several other Kopjes located in the area. 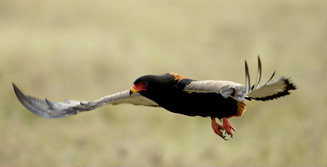 We'll have several game drives (two half-day and one full day permit) in the Ngorongoro Crater, camping near the crater rim at our luxury camp, Lion's Paw. 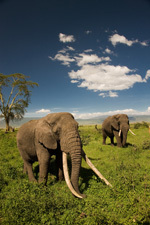 The Crater is great for bull elephants - some of the largest bulls we've seen, and you can get close. 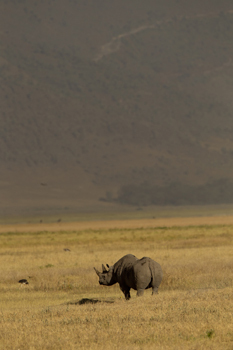 It has a fairly good concentration of black rhinos, perhaps the best in East Africa. 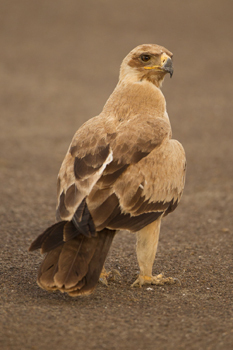 Lions, hyenas, and game animals provide very good shooting in the Crater, and the bird photograhy is great. The resident herds of zebras and gnus may be birthing at this time so we will have another chance here,and the animals inside the crater are extremely cooperative. Our Lodging and Our Vehicles: This is a luxury trip, not because we're spoiling ourselves or you, but because it truly is the only way to go and to be comfortable. Our tour company uses stretch Toyota Landcruisers, with separate roof dividers for each photographer to rest beanbags or elbows. Each is equipped with a cooler, and soft drinks and water are provided free of charge in each. With only three photographers per vehicle, each photographer has their own row of seats in which to operate from, providing ample room for yourself and for all of your gear. This is a very comfortable and a very productive way to photograph during the trip. The luxury camps are fantastic. That statement is really an understatement, as the camp staffs are simply wonderful, the food exquisite, and the accommodations great. People simply hate leaving the camps, and feel that that experience was truly as close to experiencing the sense of 'an African safari' as one could possibly have. You'll love them! 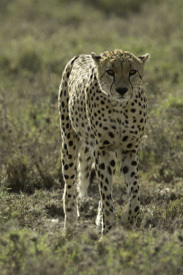 In the Serengeti we will be staying at two luxury tented camps, located in three diverse locations, at Naabi Hills near the southern Serengeti, and at Sametu, near the heart of the park, Seronera. From these location we'll be traveling to all of the best game locations for this time of year, including the Gol and Maasai Kopjis, Seronera forest, Ndutu forest and lake, and the Serengeti Conservation Area. 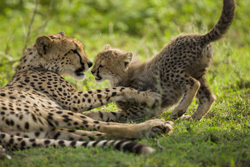 We have permits allowing us to game-drive in both the Serengeti National Park and the Ngorongoro Conservation Area, which will maximize our opportunities for photography and for following the wildebeest herds as birthing commences. 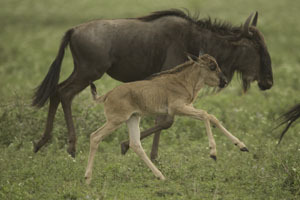 At the Ngorongoro Crater the wildebeest, and virtually every species of wildlife, are extremely tame, and if the herds are close to the road the opportunities for photographing births and mother/baby interactions are unparalleled. 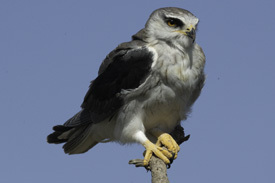 We'll be staying at our newest luxury camp, Lion's Paw, located along the crater rim and in a beautiful acacia forest. 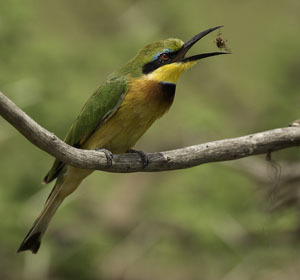 The price of the trip is based upon double occupancy, from Arusha and includes: all accommodations, including the three fabulous luxury tented camps; all park and camping fees; all special permit fees; Flying Doctors membership; internal Air Flights (we fly back from the Serengeti, what would be the worse travel day of the trip! ); all meals; bottled water and soft drinks while on game drives; unlimited water, soft drinks and laundry in the luxury mobile camp. What's not included: items of a personal nature; drinks, alcoholic beverages and laundry at the lodges; alcoholic beverages in the luxury tented camp; international airfare to and from Arusha; and any single supplement. 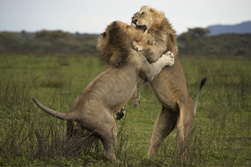 My wife Mary Ann and I strive to provide the most comfortable and thorough safari you will experience. 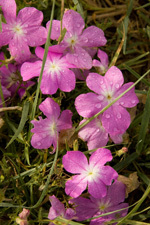 Both Mary and I are professional photographers, and I'd hope you've seen our credits. These included National Geographic, National Wildlife, Ranger Rick, Natural History, Living Bird, Birder's World, and most nature/wildlife calendars. 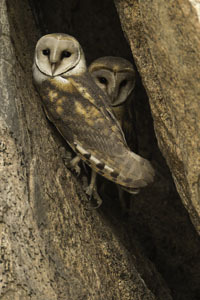 As a husband/wife team, Mary Ann and I have won more times in the prestigious BBC Wildlife Photographer of the Year competition than any other husband/wife team. To date we have had 15 firsts, seconds, or thirds -- and we have not entered every year. Our trips are not about us, however, they are all for you, but credentials seem to matter, and we have them. Mary has written twenty-nine (29) children's books, including Leopards, Grizzly Bears, Woodpeckers, Flying Squirrels, Sunflowers, Cobras, Jupiter, Boas, Garter Snakes, Pythons, Rattlesnakes, Ducks, Chickens, Horses, and Cows, and a coffee table book, Out of the Past, Amish Tradition and Faith. I've written several how-to wildlife photography books -- A Practical Guide to Photographing American Wildlife, The Wildlife Photographer's Field Manual, The Complete Guide to Wildlife Photography, Designing Wildlife Photographs, Photographing on Safari, A Field Guide to Photographing in East Africa, and the New Complete Guide to Wildlife Photography, African Wildlife, Creatures of the Night, The World's Deadliest, and several ebooks. 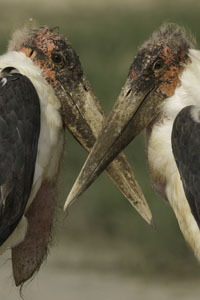 We have produced an instructional video, A Video Guide to Photographing on Safari with Joe and Mary Ann McDonald. Big Cats in the Wild, and Gorillas in the Wild. 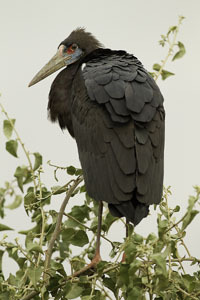 We are both editors for Nature Photographer magazine. 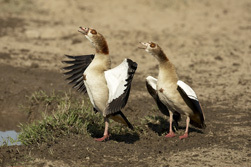 In addition to leading our trips to Tanzania, Mary and I personally lead photo safaris to Kenya, Brazil's Pantanal, Chile, Galapagos, Svalbard, India, Alaska, Rwanda, Yellowstone, Ecuador, Costa Rica, the Falklands, Antarctica, South Texas, Arizona, and some other spots, too!